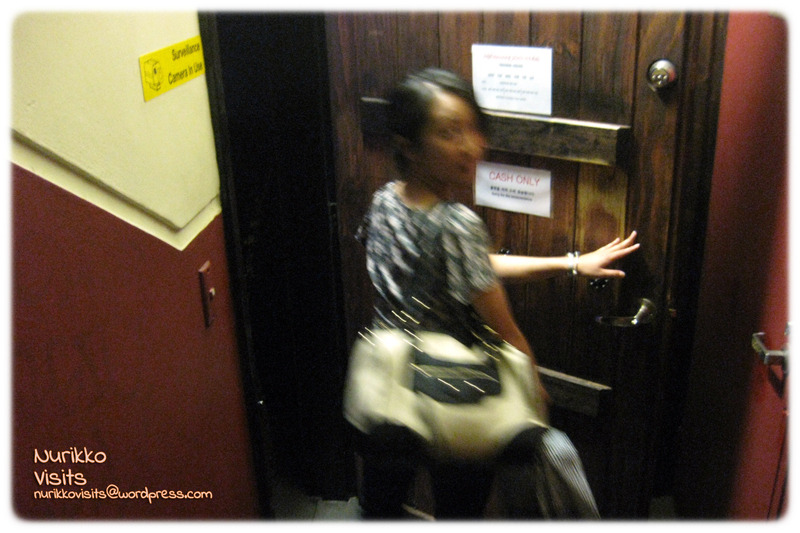 Restaurant/Bar in the basement (under the sign of Druid House) – how is that not mysterious? 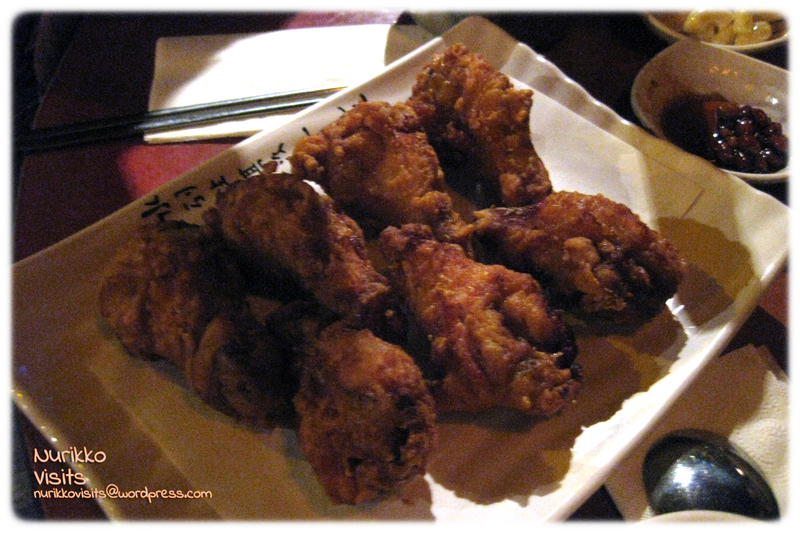 We walked through the narrow corridor under Joomak’s dim lighting, the general dining area and bar was in the inner half of the restaurant. 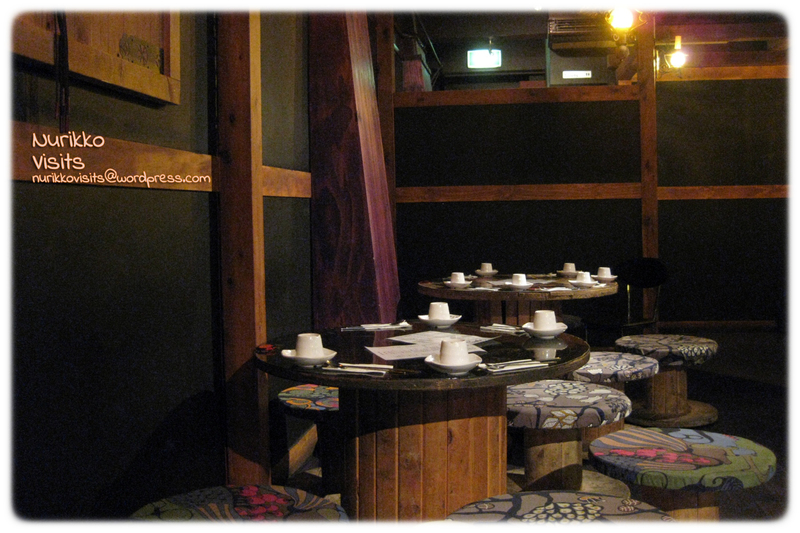 There were many wooden ‘booth’s on the side of the corridor – available for private dining; it was perfectly romantic for Valentine’s Day. One larger booth was also available for large groups. The entire restaurant had very dim lighting as mentioned before, but it was lit up slightly by the blue led lights draped over wooden booths. You know it is funky when the place is mysterious and atmospheric, a bit of curiosity for the diners doesn’t hurt, makes the expectation unpredictable. A selection of western spirits and beers is not enough? 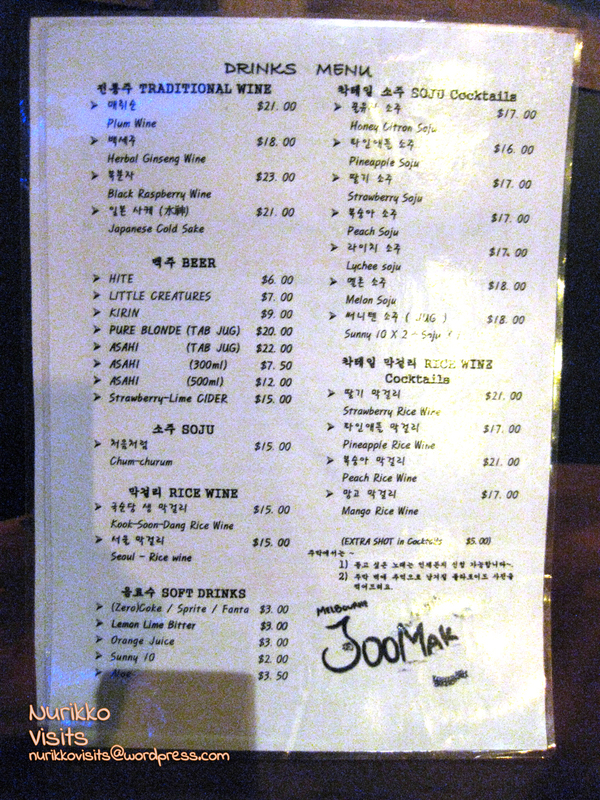 Try their Korean soju and rice wine cocktails. 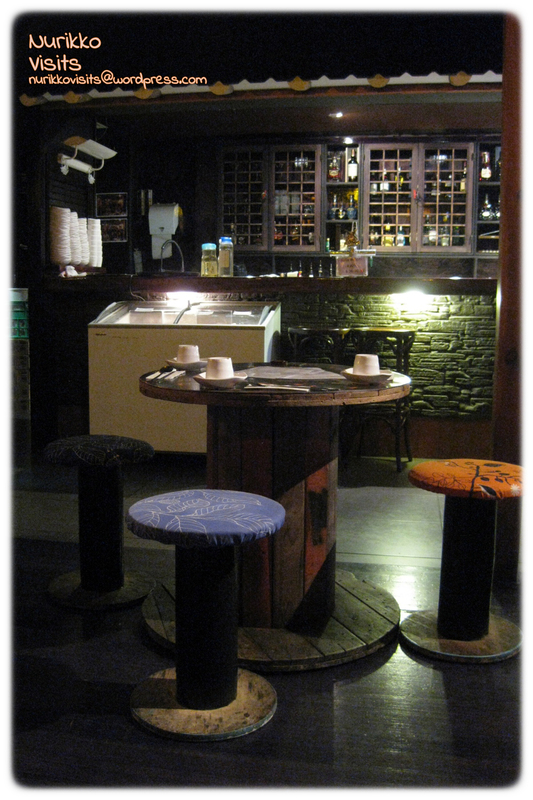 Check out their trading hours – 5pm til the 1, 3 or 5am depending on the day; a funky hangout spot. Instax photo wall – who gets to have photos taken? With a reservation for 4, we rocked up at about 7pm. Photo was too dark so I won’t upload it. It was small in portion and tasted average. I’d give it a miss. 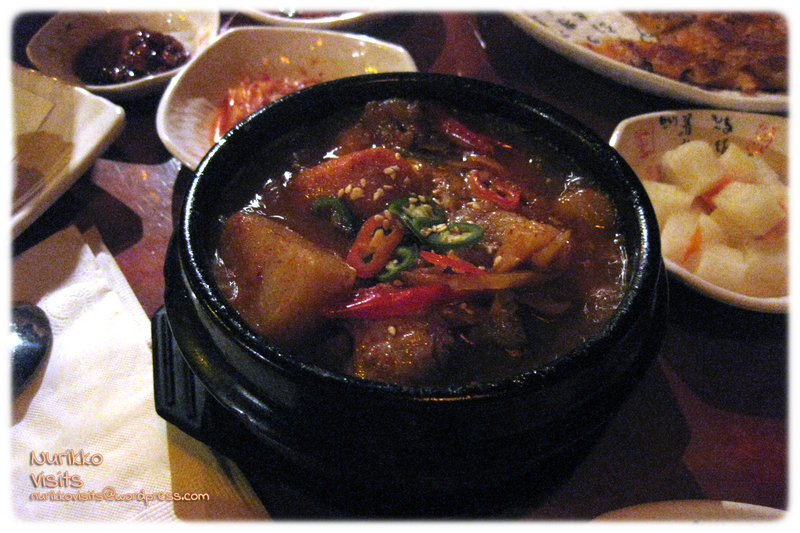 Delivered in a small stone-pot, we didn’t expect it to be so soupy. There were chicken, potatoes and carrots in it, was very flavoursome. Unfortunately it wasn’t very popular among the four of us, I was simply too full to eat it. Large, thin and greasy – the pancake is a typical guilty pleasure. I liked the pancake, but I still think the one I had in Mook Ji Bar was better. 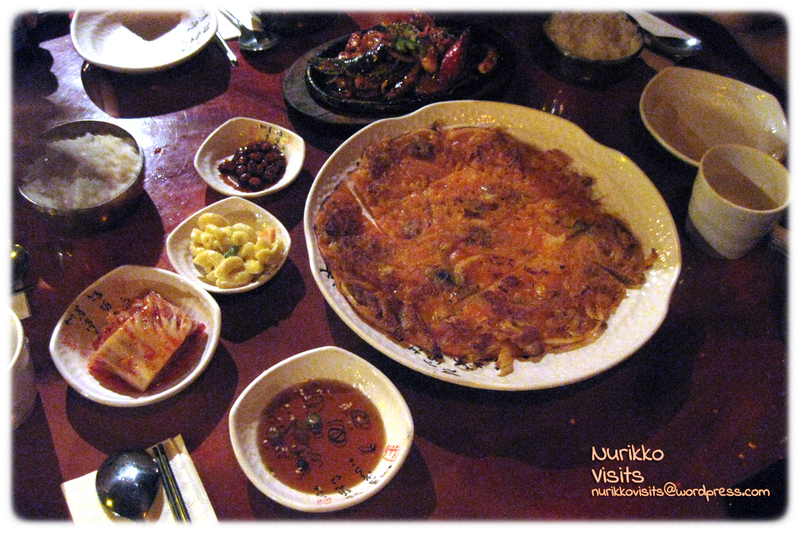 Side dishes included: (top to bottom) black beans 콩자반, macaroni, kimchi and radish water kimchi 동치미. Food was a bit dear given that the portion and quality was average-low. The waitresses hurried us subtly towards the end of our meal by interrupting our conversation and asking us whether we were finished with everything on the table. I understand that sometime they run out of dishes so they need to pack dishes away first… Thursday night can be a busy night! 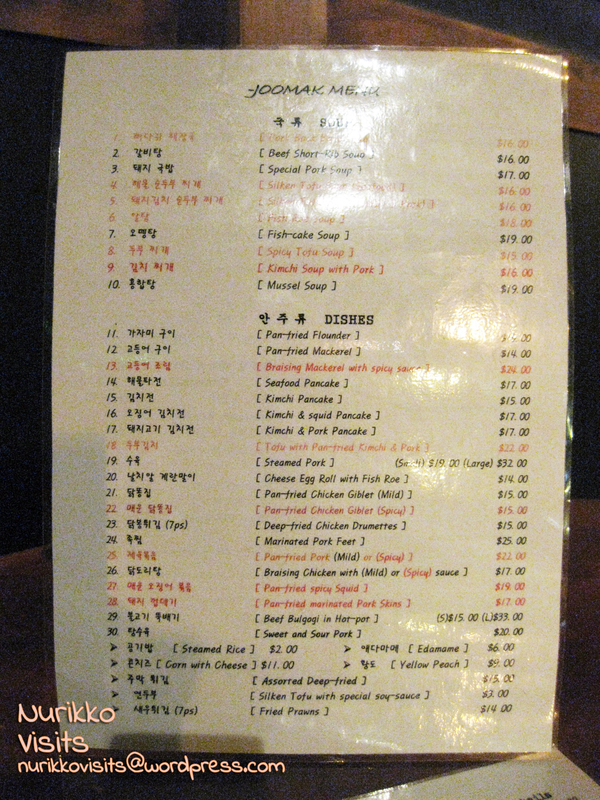 Categories: $ Cheap eats (below 15), $$ Moderately priced (15 - 30), Asian, Bar (Licenced), Deep Fried, Dinner, Event & Special Occasion, Hit, Korean, Melbourne CBD, Menu, Recommended, Romantic, Soup, Spicy, Traditional / Authentic, Vegetarian, Wide Range Beverages | Permalink.